Minimalist style has gained more and more popularity over the last few years as people lean towards simpler and more functional designs. This is especially true when it comes to home design, where less is definitely becoming more! 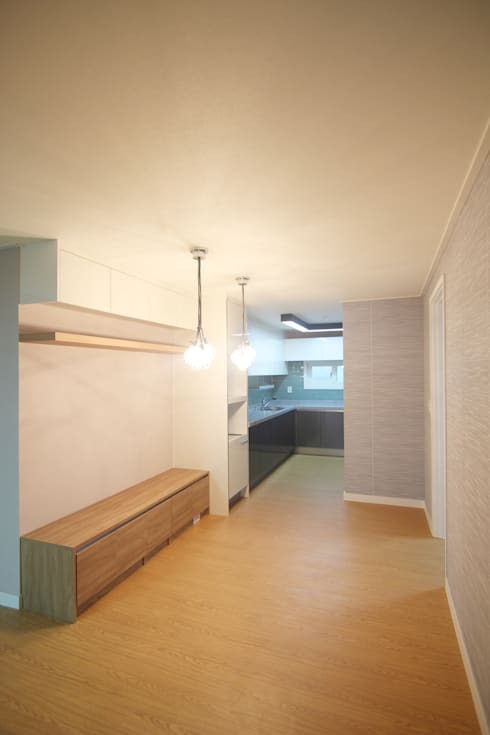 Today at homify we are going to see how Korean design professionals Light and Salt Design, have taken an old-fashioned and cramped apartment and transformed it into the epitome of sleek and chic minimalist style. Not only will the following ideabook give you inspiration when it comes to being slightly more ruthless with the items in your home, but it will prove to you just how modern and magnificent minimalist design truly is. 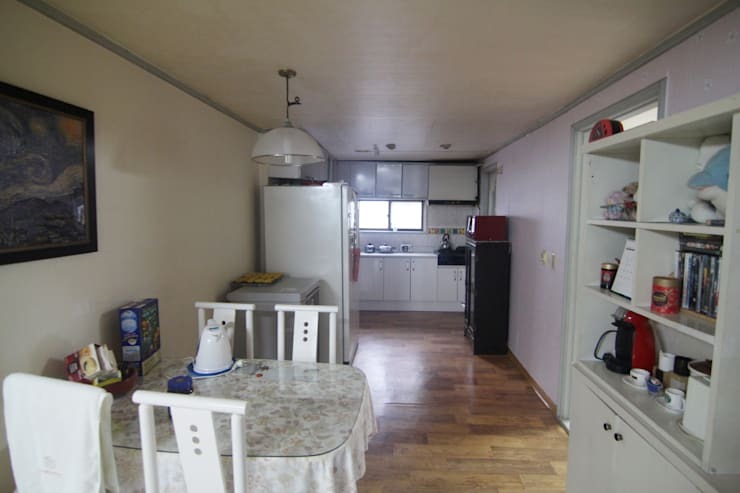 If we look at the home before the renovation, we can see just how gloomy this home truly was. For starters, there is no real natural light in this space, which makes this home look like a cave. There is also no form of beautiful artificial light! In fact, there is just a large neon light on the ceiling, which gives the room a very uncomfortable ambiance. Everything in this space is very old-fashioned and the furniture is very dark, which doesn't help. There are also way too many items cluttering the space, with nothing very well organised. Can you believe that this is even the same living room? All of the furniture has been moved out and the room has been completely redone. The designers have replaced the old-fashioned dark wooden floors with new light wooden floors that instantly lighten up the space. They've also repainted the walls a light grey colour, which creates a much more cheerful, modern and homely space. This no longer looks like a cave! The natural light makes the most difference, however and is a great feature of modern and minimalist design. By removing the curtains and painting the door frames a clean white, sunlight filters into the home! 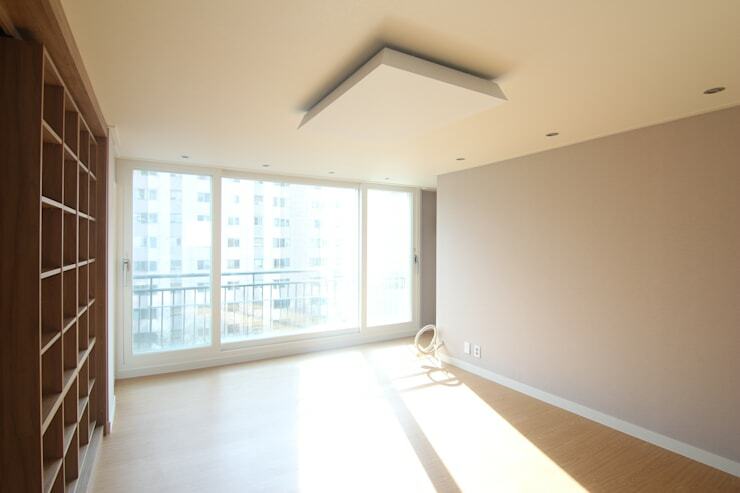 Natural light not only makes a room look warmer, but it instantly becomes physically warmer too, which means less money spent on artificial lighting and artificial heating. If we look at the dining room and kitchen space in the home before the renovation, we can see how desperately it is in need of a breath of fresh air! This looks like a space that our grannies live in. The table cloth on the dining room table is very old-fashioned thanks to the floral design, while the light in this room looks like an antique—and not in a good way! The furniture in this space is all white, which makes the room look very bland and washed out. 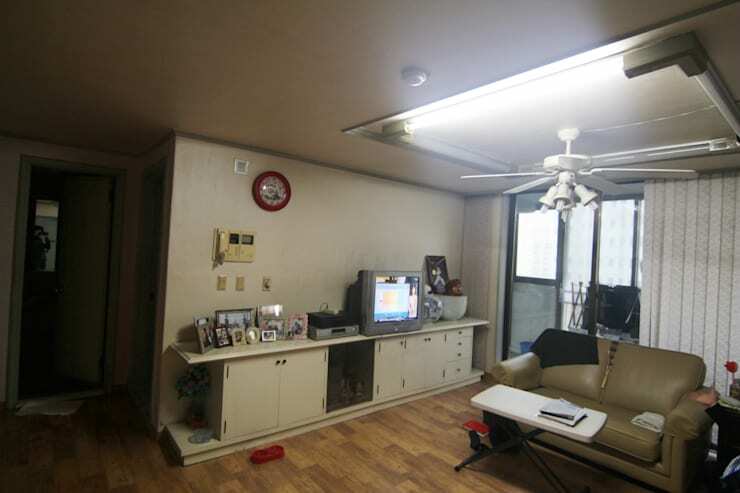 We can also see how this space doesn't feature any natural light. There is nothing cheerful or inviting about this home. If you like the idea of natural light, have a look at this: Home of heavenly light. The dining room and kitchen has been completely transformed into a modern and chic space with light wooden floors, white and grey walls and gorgeous grey kitchen counter tops and cupboards. One of the main features in this space are the newly replaced living room lights, which change the whole look and feel of the space. The designers have installed two drop down lamps, which will hang over the dining room table once it has been moved into this space. Neutral colours such as grey, sandy-wood and white create a very warm, inviting and earthy-toned space. The bathroom prior to the renovation is very small and old-fashioned. It's purely functional, very cluttered and crowded and doesn't look very peaceful or relaxing. Remember that your bathroom is meant to be a spot where you can relax and regroup, lie in a bubble bath or put on a face mask. You spend so much time in your bathroom, yet so often people overlook this space when it comes to interior design. The features in this bathroom also haven't been placed very effectively. 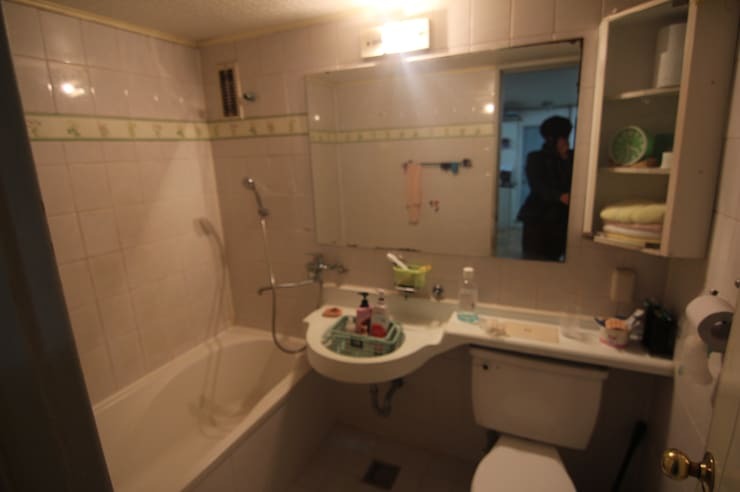 The result is a bathroom that looks very small, cramped and dull. Have a look at these brilliant, beautiful bathroom trends to see how you can improve your bathroom overnight! Can you believe the transformation of the bathroom? The designers have redone the entire bathroom, replacing the walls with grey tiles. This adds an elegant touch to the bathroom! The bathroom features are brand new and modern. The toilet and the sink are installed in the wall, suspended above the floor—a very unique design! The shower is gorgeous, with it's shiny silver features and large glass encasing. The designers have also resorted to smart storage solutions, ensuring that there is no clutter or chaos in this space. Don't you love the cabinet that hides behind the mirror? 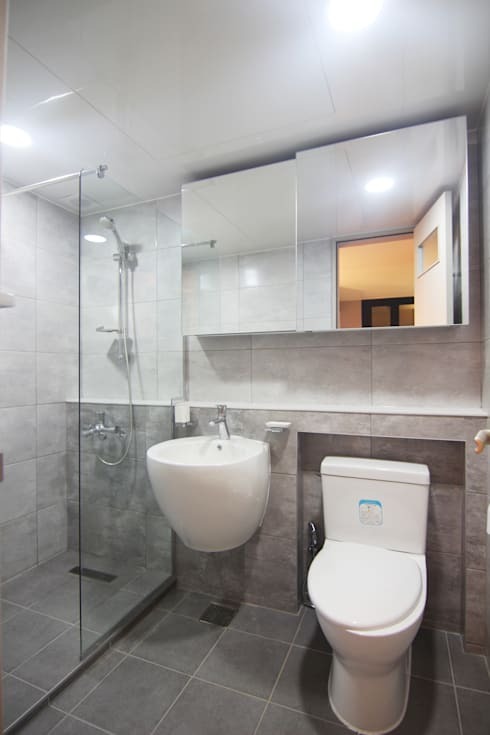 Tip: Add a mirror to your bathroom to make the space look much bigger than it really is. Also have a look at these tips on how you can: Save time and money renovating your bathroom.